At the end of May 2017, Paul and I had a discussion about SOS_SCHEDULER_YIELD waits and whether or not they could become skewed in SQL Server as a result of hypervisor scheduling issues for a VM running SQL Server. I did some initial testing of this in my VM lab using both Hyper-V and VMware and was able to create the exact scenario that Paul was asking about, which he explains in this blog post. I’ve recently been working on reproducing another VM scheduling based issue that shows up in SQL Server, where again the behaviors being observed are misleading as a result of the hypervisor being oversubscribed, only this time it was not for the SQL Server VM, it was instead for the application servers, and while I was building a repro of that in my lab, I decided to take some time and rerun the SOS_SCHEDULER_YIELD tests and write a blog post to show the findings in detail. The test environment that I used for this is a portable lab I’ve used for demos for VM content over the last eight years teaching our Immersion Events. The ESX host has 4 cores and 8GB RAM and hosts three virtual machines, a 4vCPU SQL Server with 4GB RAM, and two 2vCPU Windows Server VM’s with 2GB RAM that are used strictly to run Geekbench to produce load. Within SQL Server, I a reproducible workload that drives parallelism and is repeatable consistently, that I have also used for years in teaching classes. For the tests, I first ran a baseline where the SQL Server VM is the only machine executing any tasks/workload at all, but the other VMs are powered on and just sitting there on the hose. This establishes a base metric in the host and had 1% RDY time average during the workload execution, after which I collected the wait stats for SOS_SCHEDULER_YIELD. Then I reran the tests but ran four copies of GeekBench on one of the application VM’s to drive the CPU usage for that VM and keep it having to be scheduled by the hypervisor, and then reran the SQL Server workload. 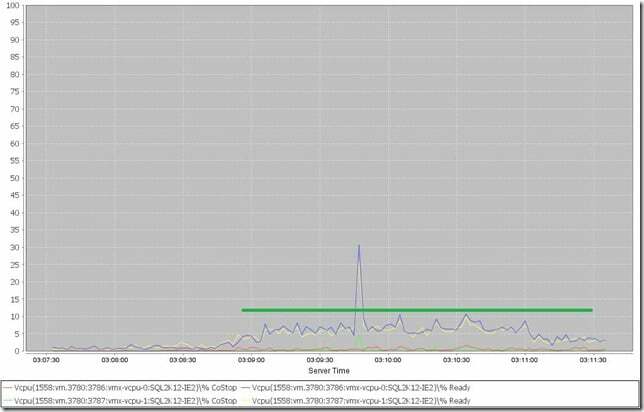 This put the SQL Server VM at 5% RDY time in the hypervisor during the tests, which is my low watermark for where you would expect performance issues to start showing. When the SQL workload completed, I recorded the waits again. Then I repeated the test again, but with both of the application VM’s running four copies of Geekbench. 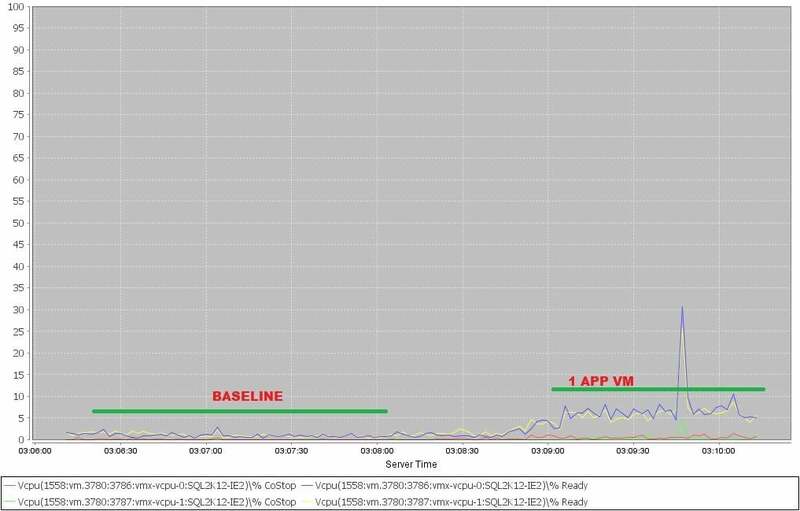 The SQL Server VM had an average of 28% RDY time, and when the workload completed the waits were recorded a final time. As you can see below there is a direct increase in the wait occurrence with the increase in RDY%. High CPU Ready time is something that should be consistently monitored for with SQL Server VM’s where low latency response times are required. 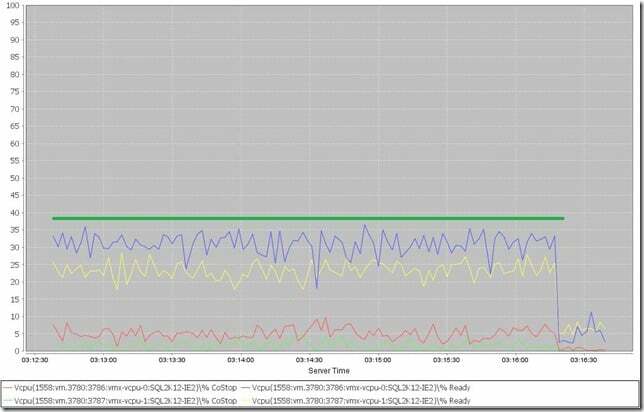 It also should be monitored for application VMs where latency is important as well. 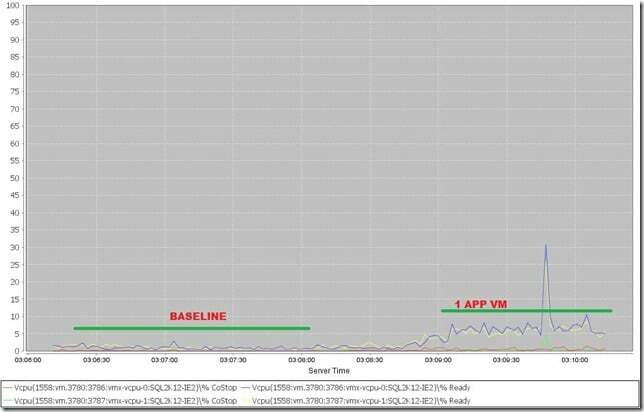 One thing to be aware of with any of the wait types on a virtualized SQL Server, not just the SOS_SCHEDULER_YIELD wait, is that the time spent waiting is going to also include time the VM has to wait to be scheduled by the hypervisor as well. The SOS_SCHEDULER_YIELD wait type is unique in that the number of occurrences of the wait type increases because of the time shifts that happen causing quantum expiration internally for a thread inside of SQLOS forcing it to yield, even if it actually didn’t get to make progress due to the hypervisor not scheduling the VM. For a few weeks now, there has been a long running thread on SQL Server Central about UPDATE operations that don't perform any changes because the statement sets a column to the same value as already exists in the row. While I believe that one of the posters is incredibly snarky and outright rude to the people trying to answer the question and explain the behaviors being noticed, the topic is quite interesting and I finally got some time on my flight to Seattle to take a look at some of the internals of this with Extended Events in SQL Server 2012. To setup the tests to be performed I am going to use the example table and row of data that are provided in that thread for the investigation with the exception that I am going to use a user database instead of tempdb for holding the test table so that I can create separate tests for a case-sensitive collation versus case-insensitive collations. Then to setup the Extended Events session for collecting information about the operations being performed, we are going to collect a number of events in the engine along with the callstack for each even and the filter on the session_id where the tests are actually being run to prevent collecting data that is not related to the tests being executed. I originally started with nearly double the events, but removed the events that were not firing for any of the tests from the final event session shown below. From the original thread on SQL Server Central, there are a couple of sticking points that keep getting brought up so in the interests of attempting to be thorough I am going to provide the testing methodology being used, and then list all of the tests that are going to be run. All tests will be conducted against both of the databases to identify behavior changes between CS and CI collations if they occur. At the start of every test, the data in the tables will have 'Tom' for the Name column. If a previous test has changed the value to something different it will be reset before the test is executed. The event session will be stopped and started between each test to isolate the data collect to each individual test. All of the tests will be run once initially to allow the execution plan to be generated and cached in the plan cache, and then the test will be reset and rerun so that the event session doesn't capture the page allocations and locking/latching associated with compiling/caching the plans. Determine the way that SQL Server handles UPDATE statements that set the column to the same value that previously existed without filtering. Determine the way that SQL Server handles UPDATE statements that change the value that previously existed without filtering. Determine the way that SQL Server handles UPDATE statements that set the column to the same value that previously existed with filtering. Determine the way that SQL Server handles UPDATE statements that change the value that previously existed with filtering. All of these tests will be run against the CS and CI database. Additionally after the first tests are performed against a table without a trigger, the tests will be repeated with the following FOR/AFTER UPDATE trigger on the tables. I am not going to include the 16 frame callstack in the results in this post except where it provides useful information for the investigation of the results being collected. The callstack results in this post will be materialized through the use of Trace Flag 3656 and the public symbols as I explained in my blog post about the callstack action in the XEvent a Day series, An XEvent a Day (24 of 31) – What is the callstack?. For both of the UPDATE statements in test number 1, the following events ( they are identical for both scenarios ) are generated by the event session. Note that the locks acquired include a conversion of the U lock on the RID to an X lock as a part of the execution, and even though the UPDATE doesn't actually make any changes, two log records are generated for the BEGIN_XACT and COMMIT_XACT, and these have to also be flushed to the transaction log file, as shown by the log_flush_requested event. If we compare this to the UPDATE statement that actually performs a change to the data in the row from test number 2, we will see that additional log records are generated for the MODIFY_ROW operation, and then flushed to the log file. Notice that here we don't have the lock conversion for the RID from U to X, and we don't have the log records being generated and flushed to the transaction log for the BEGIN_XACT and COMMIT_XACT. The results for the two UPDATE statements in test number 1 when a trigger exists on the table are different than when the table does not have the trigger on it. By adding the trigger, we now have version store records being generated associated with the execution of the FOR/AFTER UPDATE trigger. The version store records are also generated for test number 2 where the column data is actually changed by the UPDATE statement being executed. On the case-insensitive collation, test number 3 and number 4 do not generate version store records. The page_allocated events have the same callstack as the previously listed callstack in this post. As can be seen by the results of these tests, UPDATE statements that do not actually change the value of a column in a row, can still have overhead associated with them, even when the database engine is recognizes that no change is actually occurring and doesn't actually affect the row on the page. There is still overhead for the exclusive lock conversion and the implicit transaction that occurs as a part of the UPDATE occurring when no filter is provided to check the value currently on the row against the value being SET, and there is added overhead for row versioning if triggers exist on the table. Looking at the callstack for the LOP_MODIFY_ROW log operation, we can also see that changes being made affect the specific row on the page. The changes are NOT made on a separate page allocated by SQL Server to allow a binary comparison of the two pages, as suggested in the original forum thread that lead to this investigation. This is NOT how SQL Server behaves. This is further supported by the fact that no additional page_allocated events fire outside of the version store information being generated by the UPDATE. Since these tests only focused on the internal operations of UPDATE statements against a single row table, no realistic determination can be made for the actual performance overhead of comparing the column value to the value being SET by the UPDATE statement, specifically for what additional overhead might be incurred by a less ideal execution plan based on the additional filter criteria being optimized. This is something that I will definitely be looking at in more detail for a possible later post. However, we can see that comparing the current value to the value being set, can affect row version generation, lock conversions, and the number of log records that are generated where the data would not actually be changed by the UPDATE statement being issued.